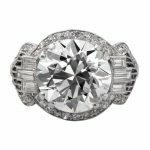 There were five separate and distinct eras in jewelry that spanned the years from the 1700s to the 1950s. Although the periods do sometimes overlap one another, the following is the widely accepted breakdown of the historical eras. The Georgian Era lasted for over 100 years and spanned four English Kings: King George I, King George II, King George III, and King George IV. While the era is impressive simply because of the length of time it encompassed, the reality is that Georgian Era jewelry advanced more slowly than the jewelry styles of other eras. High-quality Georgian Era jewelry is difficult to find today. Most of the fine Georgian jewelry is sitting in museums, is lost, or is part of an heirloom. Typically pieces from this era consisted of high karat gold and silver. The common stones found in Georgian jewelry consist of foil-backed diamonds, topaz, and garnet and primitive cutting tools and techniques were used. The diamond cuts are point-cuts, table cuts, Old Mine cuts, cushion cuts, single cuts, and rose cut. To learn more about the jewelry from the Georgian Era, click here to read our complete guide. Not surprisingly, the Victorian Era is a reference to Queen Victoria of England. She reigned during this time and was responsible for much of the great changes in the jewelry styles. The era itself splits into three periods. Each of these three stages correlates to the different periods of Queen Victoria’s life. Jewelry from the Victorian Era is far more prevalent than during the Georgian Era and easier to find. Gold and silver remained the most popular metals in Victorian Era engagement rings and other pieces. Stones popular during this time were garnets, amethyst, turquoise, sapphires, pearls, and diamonds. Motifs involving animals, especially snakes were very popular. The Edwardian Era follows the reign of England’s King Edward. King Edward reigned from 1901-1910 and was the last monarch to serve as a namesake in jewelry history. 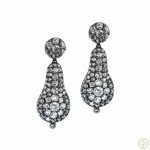 This period, also known as La Belle Epoque Era, is the first time platinum was officially a part of the jewelry scene. Although platinum was first crafted together with gold, it very quickly grew in popularity and was later an item of its own. Diamonds and pearls retain their prestigious status during this period. 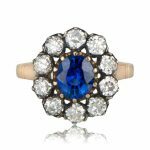 Compared those of the Victorian Era, Edwardian engagement rings and other pieces from the Edwardian Era are ornate, intricate, and flowery. 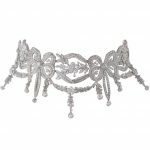 Contributing to this style are the techniques of openwork filigree and fine milgrain introduced during the Edwardian times. The Art Nouveau period, derived from the French for “New Art,” was named after the 1895 opening of Siegfried Bing’s Parisian gallery “Maison de l’Art Nouveau.” This era’s aesthetics is also Arts and Crafts, Jugendstil, Liberty Style, and Secession, to name a few. Designs of this era are organic, flowery, and draping. While the timeframe of the period overlaps with the Edwardian Era, the styles were entirely different. 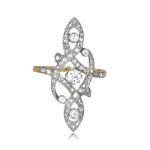 While Edwardian Era jewelry is full of detail, symmetrical, and delicate, Art Nouveau jewelry is a celebration of free form. Art Nouveau style contains an organic structure with no symmetry. Genuine Art Nouveau jewelry from the early 1900’s is very difficult to find. The Art Nouveau jewelry that has survived is very hard to obtain. Click here to learn more about Art Nouveau. A far cry from Georgian Era jewelry, Art Deco pieces are known for being geometrical, angular, and clean. The Art Deco style inspired many architects to design landmarks using these concepts. Platinum was the primary metal of the Art Deco Era. The diamonds, sapphire, rubies, onyx, and emeralds helped assert the bold and prominent aesthetics of the time. If you want to learn more about the Art Deco Era, click here. Which jewelry era is your favorite? What is your favorite era among the five eras of antique jewelry? Tell us in the comments below. The pictures of the bracelet and earrings come with permission from M. Khordipour.